Next Thursday, Microsoft's answer to the Apple iPad, the Surface Go tablet, will launch. Including one model available only from Costco, there are three different versions of the slate. One is equipped with 4GB RAM and 64GB of eMMC storage. This unit will sell for $399. 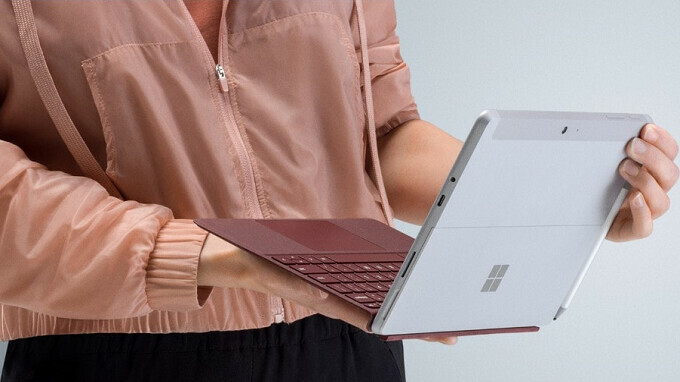 Spend $150 more, and you can grab a Surface Go with 8GB RAM and 128GB SSD storage. The Costco variant features 4GB of RAM, 128GB of SSD storage and a black Signature Type Cover, valued at $99. The warehouse membership club is asking $549 for this unique model. Surface Go tablets sport a Gorilla Glass 3 protected 10-inch display, carrying an 1800 x 1200 resolution. Under the hood is a dual-core Intel Pentium 4415Y processor. An 8MP camera graces the rear of the slate, with a 5MP front-facing camera included. Up to 9 hours of battery life can be squeezed out of the Surface Go, which runs on Windows 10 in S mode. If you are interested in checking out the Surface Go, we can tell you that demo units have now arrived at stateside Microsoft Stores. With the weekend coming up, if buying a new tablet is a high priority for you, mosey on over to the nearest Microsoft Store and check out a Surface Go demo. Make a family event out of it, and you can bribe the kids by promising to buy them some ice cream afterwards. Microsoft is now taking pre-orders in person or online for the tablet, up through next week's August 2nd release date. If you don't know where your local Microsoft Store is located, you can find out by clicking on this link. 4GB RAM. Perfect for running Windows XP. Bugs? Are we talking about iOS11 again? Seriously, M$ does have an interesting device, that can even run programs and not just brain dead "bigger iPhone" apps. Sadly the choice of an incredibly slow SOC is no-go for me. Even more than year old 10" WinTablet made by Samsung is like 50% faster in daily tasks. 4GB for this type of device is enough. Not like it can run anything more demanding. + eMMC for 64GB model? That is just pathetic. As i see it, it's much better to pick up Surface 4 Pro m3 variant - it is often discounted, it costs around the same as Surface Go 128/8. iOS 11 bugs are nothing compared to Windows. I’d wish my pc to be as trouble free as my iPad on iOS 11. If Win10 would have such a OS and hardware breaking bugs I be on Mint for a long time now. I do not have battery drain or broken speakers with every other update on my laptop, but my iPad, that is another story. I have three devices on ios11 and never had problem with speakers or draining batteries. You must have a kind of hardware problem. It can't be a hardware problem if it worked with iOS 10 and it works with some iOS 11 updates. BTW that joke with no draining was really funny, not like almost every Apple user experienced it... and it was documented as well. You can't ignore that they'd done a sh*t job with updates and overall maintenance on prior surface devices. Regular updates alone might have saved consumers the trouble of battery failure & the "flickering screen problem" they'd had on recent models, yet the cost is enough for many who'd been duped to swallow their pride and go with other devices. Ooh this is good to know! I'm hoping that one would be available at the kiosk in the mall that is like ~26 miles from me.